People laugh when we say the boat is our home. How can that be when it's so far away from the UK? But for us home is where we can relax, with all our familiar bits and pieces around us - all those things that you don't, or can't, take on holiday with you. Of course, our home is in a foreign country, an unfamiliar environment. So for us a trip back to the UK was a holiday and a chance to catch up on what we miss. Special thanks must go to Helen and Paul for giving us a base at their home at Droitwich - a sleepy town with lovely walks along the canal. Even before we arrived the postman and delivery vans were starting to arrive with goods we'd ordered online. We soon amassed a heap of things to take back: all manner of spare parts and other stuff we anticipate needing in the coming year. Although much is available in Brazil, things we want are not always easy to get hold of. Boat parts are expensive, and difficult to import. Other British essentials - like our favourite teabags and biscuits - are difficult, if not impossible, to find. We heard time and again about the terrible, long British winter, so glad that we'd not been there. But the weather was great during our stay. When we left the UK was entering a heatwave and the daytime temperatures are now much higher than here! 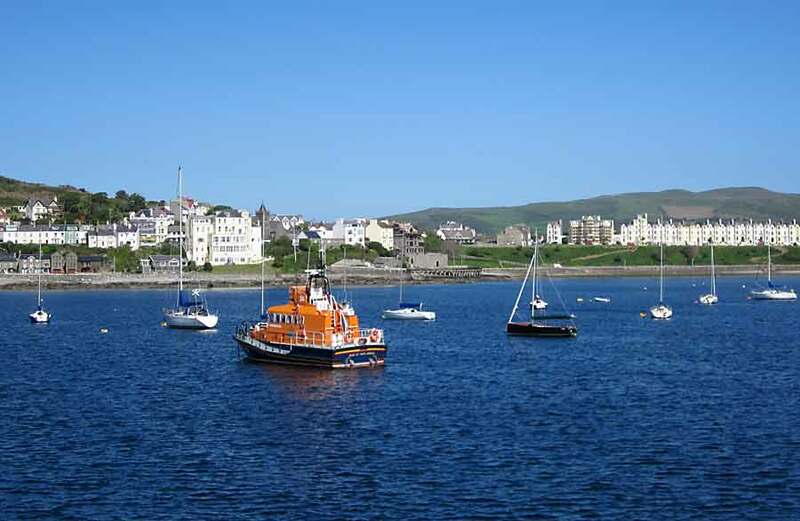 One of the highlights of our visit was a trip to the Isle of Man to see Bob and Jane. 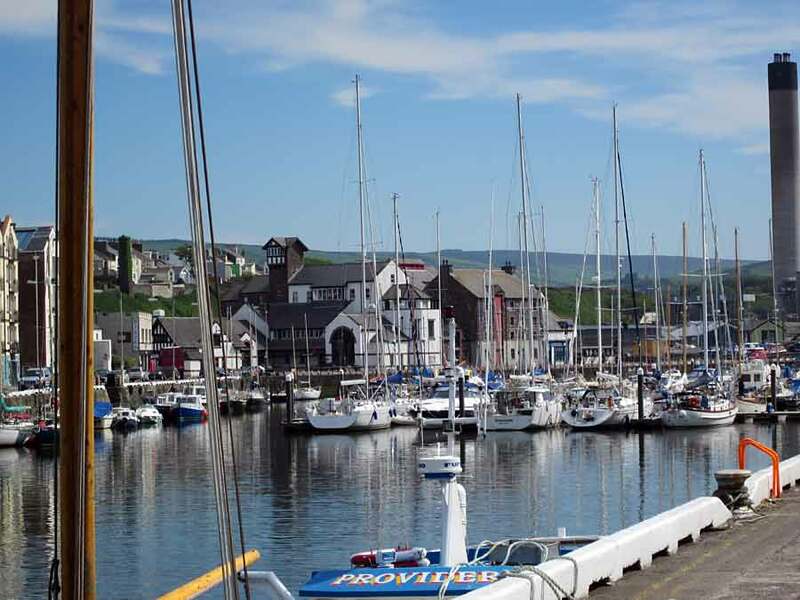 We'd never been before and really enjoyed seeing some of the pretty fishing villages and beautiful coastal views. The pace of life there is very quiet and gentle, apart from when the TT races are on. We were lucky to have calm ferry crossings and sunshine all the time. Another treat was being able to watch the sport on TV. And, what surprises were in store! First, watching the Lions winning at rugby and then Andy Murray at Wimbledon. Our eyes then turned to the Tour de France. Now back on board we are able to pick up some sports reports over the internet but sadly we were unable to watch the full live coverage of Chris Froome winning. We returned to Bracuhy in the early hours of last Wednesday morning, heavily laden with bags full of our UK purchases. Struggling along the pontoon we were happy to see Lynn Rival looking outwardly normal, but approached with trepidation knowing we had a resident rat to deal with. We had seen signs of him on the day we left and our friend Terese had subsequently put down some traps for us, but with no results. The scene that awaited us was not pleasant. At first the damage seemed superficial, but the more we explored the worse it got. Wherever it could get access, things have been chewed: wires, pipes, plastic containers, headlining, upholstery. The wire powering the ultrasonic rat repeller was severed, no doubt as a priority. 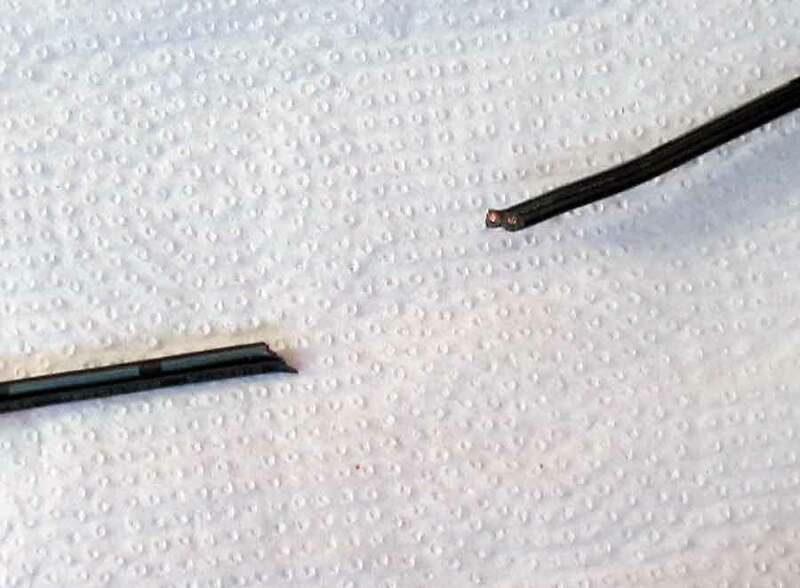 The main water filler pipe was destroyed over a length of several inches, to provide easy access in the vertical direction. One of the engine coolant hoses has deep gnasher marks - we have yet to determine the extent of penetration. Chewing through the waterpipe in the forward head would have provided little refreshment. But a combination of antihistime and indigestion tablets may have made it feel better after all that hard chewing. Three months' supply of Paul's contact lens solution was also consumed. Ratty: "That repeller is giving me a headache - if I just sever this cable . . ."
" . . . and if I can just get this damned pipe out of the way I'll be able to get up and down more easily." Usually we look forward to unpacking and installing or stowing away all the goodies we've brought back with us. That has had to wait while we clean up and make repairs. We've not seen or heard any sign of our rat since being back on board so we've no idea if it's still around. On Thursday we managed to buy a really big rat trap in Angra dos Reis and it's sitting under the saloon table primed with a piece of parmesan cheese. We've also been putting down glue traps around the boat but have to be careful not to step in them! We need a cat. Teresa has 3 but they're too well fed to go rat-hunting. Meanwhile we've cleaned up and fixed most of the damage. Paul is having fun filling the gaps that have allowed the rat to get into most of the lockers, usually where pipework runs through the boat. Are we shutting the stable door? 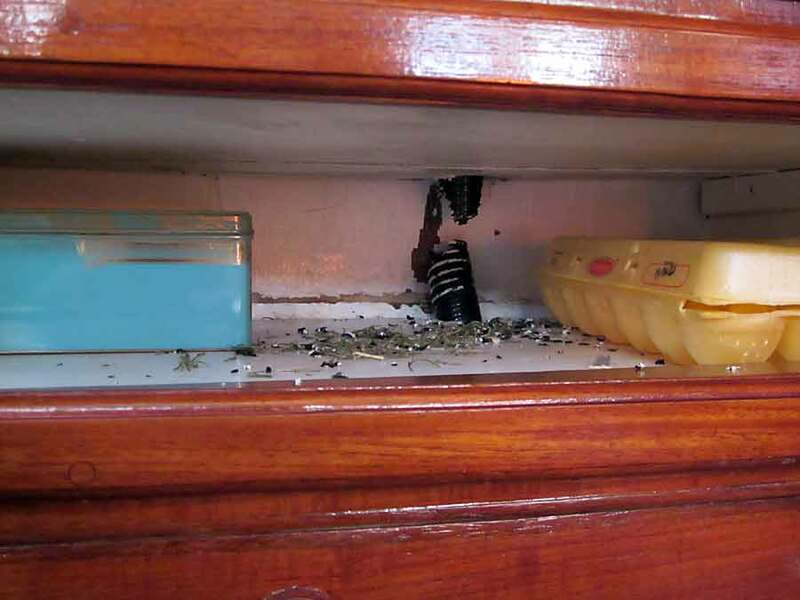 It's not something we'd thought about when refurbishing the boat, but rats are a perennial problem so worth doing. Life has not been all misery since getting back. Bracuhy is as beautiful as ever and we've enjoyed a couple of walks along the leafy avenue leading to the main road. The trees and shrubs are all flowering and looking fresh in the winter sunshine. There's an active sailing community and many retirees who live all-year-round in the "condos". We've now met quite a few locals who speak English. While in the UK we bought some audio Portuguese lessons and are now making much better progress in learning the basics. Our friends are helping us expand our vocabulary, giving us lifts to the shops, tips on cruising around here and even buying our book. Yesterday the weather suddenly turned unusually cold with the overnight temperature going down to 17 deg C. It's raining a lot and there's even snow in southern Brazil. Everyone is complaining about it and we're hoping it won't last long. Once sorted our plan for the next couple of months is to cruise around this area, including a visit to RJ (Rio de Janeiro). We've been warned off going there until the dust settles after the Pope's visit. In the meantime there are plenty of inviting anchorages and places to explore around Ilha Grande.